Get paid to chop firewood. 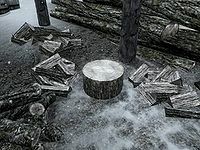 If you talk to one of the quest givers, they will offer to pay you for chopped firewood. Alternatively, you can also chop the firewood first and then sell the firewood to a quest giver later. You are paid five gold per unit of firewood. To chop wood you must have a woodcutter's axe in your inventory (one can usually be found near the wood pile). Activating a wood chopping block will then cause you to produce firewood at a rate of two units every eight seconds, with a limit of six units per activation. After you have produced six units, you must activate the block again or leave the woodcutting session. It is also possible to have a follower chop firewood for you, even if you don't have an axe. This can be advantageous as the camera doesn't go into free roam mode while the wood is being chopped (which happens when it's done by you). By having someone else do the chopping, you can keep your view focused on the wood pile and activate it every thirty-five seconds to keep more wood coming. If a second wood chopping block is nearby, you can even chop wood simultaneously to double production while only adding an extra couple of seconds to the equation. To obtain this achievement you do not need to sell the firewood, or even talk to any of the quest givers. Simply activating the wood chopping block is sufficient. With the Hearthfire add-on, doing this quest for Aeri, Gilfre, Grosta, Hert, or Hod will increase their disposition such that you'll be able to cut your own lumber. There may be no limit to the amount of firewood that you can chop at any one wood chopping block, and then sell. One simple—if painfully slow—way to get the money to purchase a house is to chop the required amount of wood. For the house in Whiterun, for example, you will get 5000 gold if you accumulate 1000 pieces of firewood. This takes approximately 24 hours of game time when the time scale is set around 10, or 25 minutes in real time. At the standard time scale it is possible to chop 150 pieces of firewood in 15 real-time minutes, which is a pay rate of 3000 gold per real-time hour. Money you get from chopping wood is fixed and is not affected by your Speech skill. This can be important to remember, as it is one of the few ways to earn money without increasing any skills, which will help control your level. This is useful when wanting to train in a certain skill as many times as possible. It is also one of the few ways to earn money without doing any questing, merchanting, or crafting. If you don't have a woodcutters axe on hand you can ask a follower to chop wood for you. Just go up to the wood chopping block and talk to your follower. When it says "I need you to do something for me", hit "use" on the wood chopping block. To retrieve the firewood, trade Items with them. This page was last modified on 15 September 2018, at 15:32.